The first objective for your team is to disrupt the collective. From the beam in point you will have to go straight ahead into the large room known as the Central Plexus Chamber. There are Node relays here that allow the Queen to interact with the rest of the Borg fleet. You'll need to defeat the Borg drones around these nodes and then disable the node. There are two platforms here, the upper (which is where you walk in) and a lower one. Each has four nodes. You can go through the upper platform first by going either clockwise or counter-clockwise. WARNING: If you are defeated while battling the borg DO NOT respawn. If you do it will send you into a holding cell. Your teammates will need to activate the transporter console outside of the cell to beam you out. I suggest waiting for a teammate to revive you instead of respawning. Also be careful of the edges, don't jump over the railing because you can fall all the way down and die, forcing you to respawn. While you are working on this room there will be some platforms that turn green. Move away from these as quickly as possible because they will send an electric shock that will kill you. At each corner of the room is a node. Activate it which will then cause the Borg to attack you, then defeat them and disable the node. Do this for the first four nodes on the upper platform. When that is done take the ramp to the lower platform and repeat. There is an optional objective to complete this room in 5 minutes. When you are finally complete with this room go through the north exit and follow the path to the next room which is the Collective Core Chamber. You will need to upload a virus to the core and stay in the room while the virus is being uploaded. In here you will see some green beams targeting each player. Keep moving around the room that when they fire you won't get hit. Borg drones will also appear and you'll need to fight them off if you want to survive. Just to warn you, this room is a bit harder than the last one. After the virus has been uploaded continue through the north exit to the final room where the Borg Queen is. This is by far the toughest part of the mission. If you die you will respawn in one of the four holding cells in each corner of the room. Your teammate will need to activate the external transporter console and then you have to activate the inside one to beam out. When you reach the room you will see a ton of Borg drones protecting the Queen. Defeat the Elite Drones first since they are the hardest, then go ahead and take out the rest of the Drones. The Queen will then emerge and you can battle her. 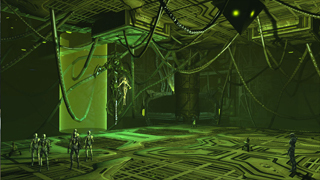 Throughout this entire battle keep an eye out for the growing green floors and the targeting beams from the ceiling as well as other Borg drones that beam in to do battle with you. While the Borg Queen is out you should focus fire on her. Eventually she'll go back into her alcove for a little bit then come out again. Just keep battling until her and all the Borg drones are defeated. Congratulations! You've defeat the Borg Queen... or have you? 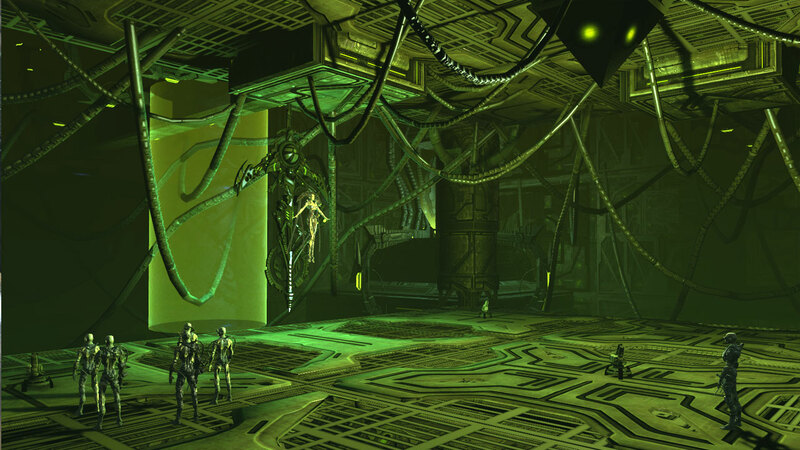 This mission takes place within Unimatrix Zero where you will need to defeat the Borg Queen who trasnferred her consciencousness to a Borg Diamond. The overall strategy is simple but the mission can be difficult. First defeat all the Borg ships around the diamond. Try to draw each Cube away from the rest one at a time. This should make it much easier to destroy them quickly instead of having them all attack your team at the same time. Avoid using anything that could potentially draw more than 1 Cube at a time. Once they are defeated there will be a short cutscene. Two Unimatrix ships will warp in, on each side of the Borg Diamond. Your team should focus on only one of these at a time (usually the left one first) and stay close to the ship on either side. Never go in front or behind the ship. Personally, I like to stay right on top of the ship in the middle but you don't have to. Throw everything you have at it until it is destroyed. If you find that the Plasma Energy Bolts sneak up on you then zoom out all the way so you can have a better view of the map. After the first Unimatrix ship is destroyed repeat the same thing on the other ship. 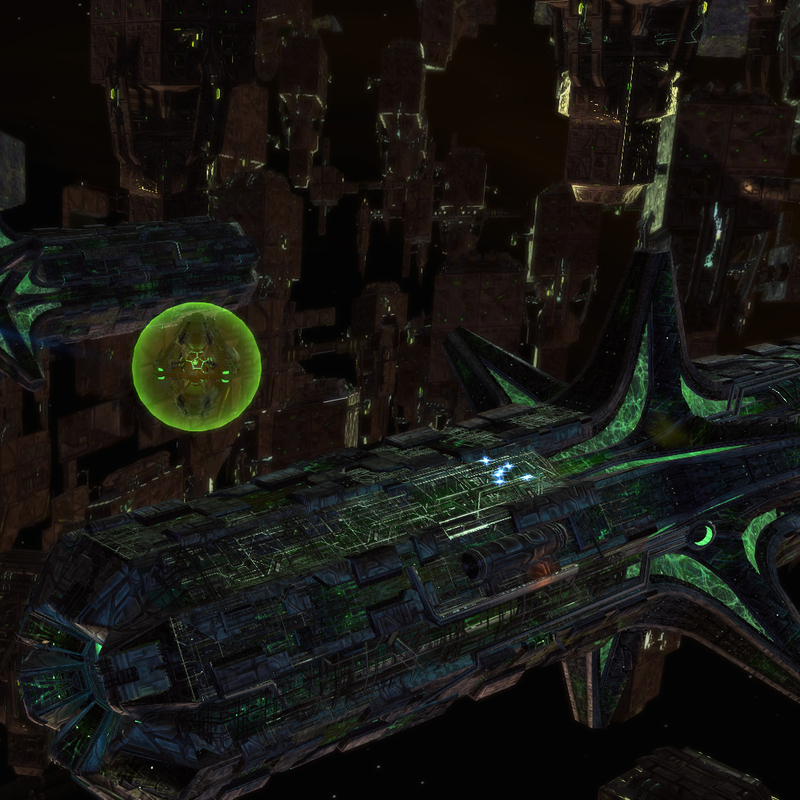 Once both ships have been destroyed, the Diamond with the Borg Queen will activate and you'll need to battle it. This battle is actually somewhat easy, it just takes a long time to defeat her. Keep firing and throwing everything you have at her until she is finally destroyed. That's the end of the mission, congratulations!